One of the earliest and most popular local spring crops to come into season every year is asparagus grown by Milberger Family Farms of Pueblo. THE ASPARAGUS WILL ARRIVE SOON: It’s uncertain whether Milberger asparagus will be available in time for Easter this year, since the holiday falls on Sunday, March 27, earlier than most years. The good news is that Shane Milberger has already cleared the field of overgrown asparagus fronds to reveal the tender new spikes! And that means asparagus picking could begin as early as two weeks from now, depending on whether the unseasonably warm spring weather continues. THE CHILES ARE HERE NOW: Far and away, the most beloved crop grown at Milberger Farms is the green chiles. By freezing them in the fall, fire-roasted chiles can be enjoyed year round. At Milberger Farms, the family and crew indeed eat chiles with everything. And with good reason: chile peppers are an extremely healthy food. “One chile has more Vitamin C than eight oranges,” Shane says. Here’s how you do it: thaw the roasted green chile and chop it fine, then mix it into softened butter, thoroughly combining the two. You might want to add garlic as well because the consensus at Milberger’s is that the two are like Ernie and Bert: you can’t have one without the other. An obvious way to use the chile spread is to get a loaf of good bread (try the artisan sourdoughs made by Shawn Saunders, available at RFD) put the spread between the slices and warm it in the oven to make an easy version of chile-garlic bread. Another idea is to make a batch of spaghetti noodles, and gently toss them with the chile butter, season and serve, Shane says. Still another idea is to add the chile spread to homemade refried beans, which you can make by cooking Colorado grown pinto beans and mashing them. Mix in the chile spread and some cheese, and you have a perfect side dish for tacos, burritos or tamales. Or you can serve the mixture as a chile-cheese-and-bean dip. Not surprisingly, when the Milbergers make salsa, they go heavy on the chiles. Shane recommends playing with the chile-to-tomato ratio when you make salsa and taste the difference for yourself. And be sure to add garlic, since… well, you know the drill. Did you know?… Ugly Dawg salsa is made with peppers from Milberger Farms! 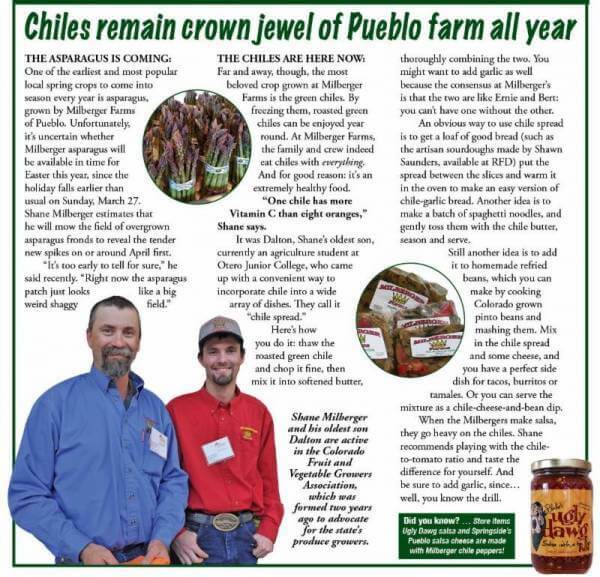 Milberger chiles are also used by Springside Cheese of Pueblo to make their Pueblo salsa flavored cheese. And the fresh meat case at Ranch Foods Direct now offers fresh ground beef and chile patties featuring chopped chiles grown by Milberger Farms.